That's me, crouched on the far left! ﻿﻿﻿﻿But not all memories are pleasant ones, I'm afraid! 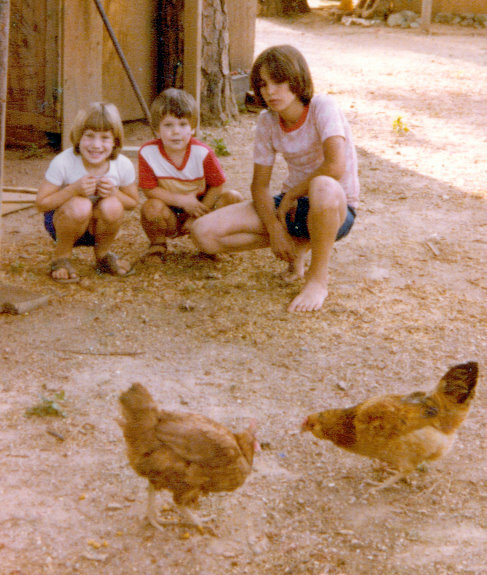 Truth is, my grandparents had MEAN chickens, ones that would peck fiercely or chase you if you got too close (hence the picture; that was as close as we dared to be! You can see the look of fear in my eyes ;-). I loved to watch them search for bug treats, listen to all the different sounds they made, and the simple way they explored the world around them. At night they would perch in the trees next to the house, even though my grampa tried to keep as many in the coop at night as possible....they would eventually all be eaten by something, a predator who found an easy dinner, and grampa would bring in a new batch of birds. I can still remember taking the kitchen scraps out to the coop and the smell of pine shavings as I collected the eggs from the nest boxes...it's funny how those simple things stand out in your mind. I was determined that some day when I had a home of my own, I would have NICE chickens...friendly ones that wouldn't peck or attack, that would let me pet them! Whooyoo! Little did I know back then that I'd end up with so many, and that "chickens" would be such an important part of my life as an adult. Life's funny that way, isn't it? Thanks! We were all kind of huddled down watching them, and my uncle was probably telling us something about the chickens. That is my brother sitting right next to me.